“From a psychologist and psychotherapist’s experience Adam uses effective ways of integrating trauma which quickly access the origin of the issue. 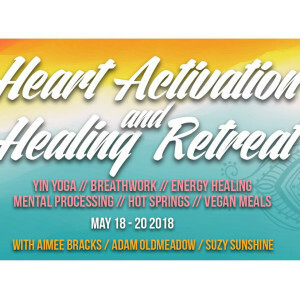 I found my experience of Adam’s work and the methods he uses to map up the body as well as EFT which accesses the body’s unconscious a powerful healing technique to remove resistance. This unlocks the blocks and releases the issue or trauma by accessing the cause and releasing it. All of which are most powerful as they enhance and empower the client to access their own wisdom from a more integrated/holistic perspective. Adam’s work with me, using Matrix Reimprinting and Meta Medicine has been so beneficial to me. I have Lyme Disease, and it has been a long road for me with a lot of illness, and discouragements along the way. Adam has helped me to heal from this disease. He helped me get to the root of the issue, and kept guiding me towards my own answers. I have gone from feeling discouraged, disorganized and exhausted to having hope, regaining energy and finding my center and organizing my life. Julie Johnson, Clinical Social Worker. I ended up doing an impromptu session with Pam. She was a participant on the course had been experiencing terrible lower back pain for about a week since she’d slipped and fallen on rocks whilst rafting on holiday and had had little opportunity to rest it since. Importantly, whilst she fell on it and it was a physical injury, there was still a reason why she attracted that injury to that part of her body at point in time. In working with me, we addressed it and reduced the pain from so intense she could barely walk up the stairs to the event and was uncomfortable the entire time, to being enormously relieved and even skipping down the same stairs the next day! Another benefit was that she immediately stopped taking double the recommended dose of extra strong pain killers – a huge benefit for her whole body as it was definitely not a long term option! Adam helped me clear up a chronic back pain condition. This had been troubling me for years and no amount of work I’ve done on it myself has come close to the results Adam got working with me. Adam has a strong skill and capacity to use intuition and dynamic change tools to assist one with the change one is choosing. The results speak for themselves. Thank you Adam! Thank you so much for today! Funny thing – my right shoulder/neck area has been giving me trouble for ages. My chiropractor has been working on it for a long time and it’s just never felt like he’s got the right spot or that it’s shifted – well of course today there was this massive double whammy crack and my god it feels better! Thank you for shifting the energy around it so it was able to move. He also did work in another area that’s been giving me trouble but hasn’t shifted properly and again that moved. Not like the shoulder thing but still way better. I really like the questions you made me think of. I also liked the idea of calling the darkness/old habits/beleifs etc an entity. It kinda makes me think of it as something other than a part of me and therefore something that’s not ingrained – something that can be kicked out and rotten rid of. I felt so good coming home. I reckon I’ll sleep well for the first time in ages tonight! In the week leading up to my appointment with Adam, I had been feeling incredibly sick and was unable to eat very much, despite the fact that I hadn’t made any recent changes to my diet. I was still making meals and trying to eat some, but was really only managing a few mouthfuls per meal. Adam used EFT to explore the reason behind the feeling of nausea and to help me release those emotions. When I went home from the session, I ate both the leftover lunch and dinner from the previous day that I had been unable to eat and I was STILL hungry! Needless to say, the session had a huge impact on how I was feeling and I was able to get back to eating proper meals again. Adam is an incredible healer. His ability to be fully present and sensitive allowed the space to work through some traumatic sexual assault issue that I wouldn’t share with anyone. 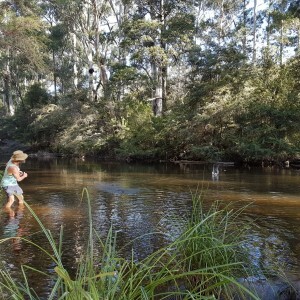 I left our session feeling 100% lighter, more relaxed and at peace than when I came. I also got clarity on the things I needed to change to continue my healing. I had to face quite a big traumatic experience with a lot of emotions attached to it. Adam was able to guide me through this process with ease and grace to assist me in facing my fear and letting go. I felt a wave of relief wash over me and a feeling of clarity and amazement at how wonderful I am. “I went to see Adam not really knowing what would happen or what to expect, but that didn’t matter, the energy leading up to the session was magical and exciting. I arrived at the location and we spent some time in the garden attuning with nature, then we went inside to the room and spent some time exploring and re-creating and forming friendships with that within my subconscious and energy bodies. 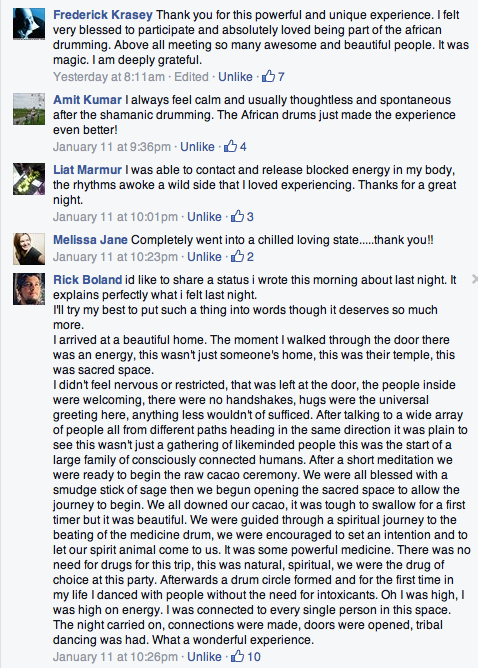 It was a truly life-changing and enhancing experience. I re-lived moments of past lives and this current life and re-structured past events to they would no longer hold me back. Highly highly recommended. Adam has a unique gift with bodies and beings. He worked on my heart and opened it up to receiving so much more and sharing so much more love. The gratitude I felt bubbling up from within me brought tears to my eyes and so much love to my heart space. I integrated a lot more of me into my being in that short session with Adam. So grateful to you!! Thank-you for sharing your gifts with me!! “Wow, where to start? My experience during the course was unbelievable and a major eye opener to me. It is one thing to be told these techniques but it was a completely different experience to try first hand and see the results. I honestly believe I can go out into the world and use the skills I learnt effectively. Adam was an amazing facilitator very patient, answered all my questions and gave me plenty of attention to help with learning all the techniques. 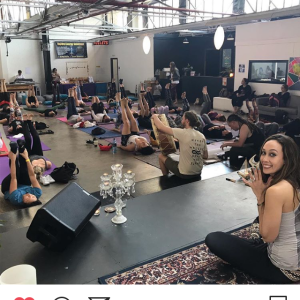 During the course I definitely experienced a major energetic and awareness shift which was shown during my experiences. Prior to the course I had only been slightly shown what is possible when you open up to what I would call the spiritual realm. Being from a business orientated lifestyle it was a refreshing, much needed wakeup call which I’m glad I received. This change I can see will be a permanently lasting one. The course was held in an amazing location with everyone present and holding space during the course and I’m so glad I got to experience this. The visions I had during the use of one of the techniques both defied my logic and should not have happened according to what I’ve been taught previously by society. At first I found it extremely weird but eventually opened up my mind more to the possibilities and was amazed with what I learnt. 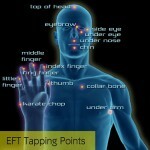 The EFT acupuncture point tapping technique was very effective which actually took me by surprise. Through seeing how it was done and then trying it out too I managed to see the effects it had. 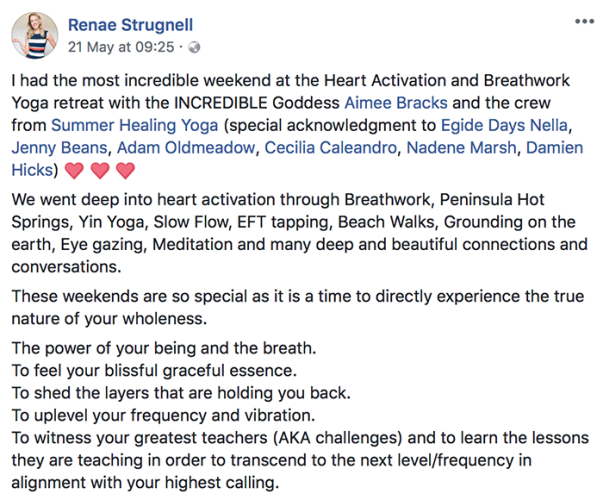 The Heart of Healing was really valuable for me as a new practitioner. It gave me frameworks and tools for connecting with clients and meeting their needs. It helped me think about my healing space and how to prepare it. Adam was professional, knowledgeable and displayed a comfort with his healing knowledge that comes from years of experience. This helps me step up to the next level. “The 2-day Meta-Health course was packed with information that I can now take away & incorporate into my healing work with clients. I had been experiencing inflammation/swelling in my ankles over the past weeks and the course provided me with interesting insights to with to resolve the underlying emotional causes. Adam was very generous with the information that he shared and worked with us at a pace that was comfortable. He included meditations and other exercises which helped with consolidating our knowledge. “I went into MS remission 12 months ago, but I didn’t 100% know how I did it or how to achieve it long term. Adam’s training helped fill in some of those important gaps. There were heaps of discussions about the material provided and the questions asked were answered in a way that furthered my understanding of the material and of what I was searching to understand regarding my own health. “I discovered Metaphysics for myself reading Louise L. Hay ‘You Can Heal Your Life’. My self-awareness grew as did my curiosity. Meeting Adam and being introduced to Meta Health has been wonderful act of fate. Adam’s quest to share his knowledge and open hearts is inspiring. Our medical system world-wide has lost track; We swim in circles of questions and symptoms, blindly accepting scripts. I feel Meta Health can take us to the heart of the matter by consciously re-connecting us with ourselves, using the information as guide to listen to our bodies for message it wishes to communicate to us. Health is our true worth, and the best gift you can give someone are the tools to improve on that. “The training has given me a really amazing intellectual framework that will help to compliment my intuitive abilities in deciphering the subconscious belief patterns that feed an illness. I loved Adams teaching style. He was really clear with the way that he taught and gave adequate breaks throughout the course. He is also really relaxed and relatable with his teaching style, making it easy to relax and absorb the teachings. “I invited Adam to come along to do a workshop with my VCAL Personal Development Skills class. As our focus for this semester was Health and wellbeing, I thought this might be a very healthy experience on focussing on the mental side of their development. They were already engaged in physical training with a personal trainer from a local gym and for me this experience was something none of them would have had in their lifetime. I met with him prior to the session to give him an idea of what it was I was after. We agreed the session would simply take a form and shape of its own. Adam was going to come to the classroom and simply be guided by the energy and feeling that prevailed during that session. On the day in question, I was juggling two classes simultaneously but from the moment Adam walked into the room he commanded the attention of the students. His look, the drum and I guess the unconventional appearance of him made the students more intrigued. He took charge even before I managed to introduce him to the class and from that moment on, my class was his. As the session continued and he set the mood and the students felt comfortable with him, they opened themselves to the experience. Some started responding to his questioning techniques and if I may say they started trusting him. For some it unnerved those with the awakening of feelings and emotions buried within them. As he had brought a drum along with him, they were quite intrigued by that. As a closing session, he asked them to stand in a circle and shut their eyes. He started beating the drum and moved around the room stopping at each student. They all stood still and totally embraced the moment and allowed themselves to simply live in that moment. I was so amazed at these students reaction and response as some of them have serious problems staying connected and focussed for extended periods of time. He managed to engage them for the entire time he was there. 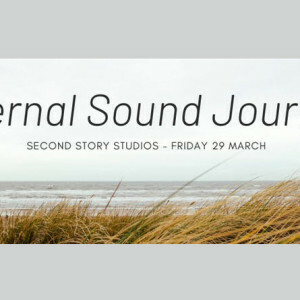 At the end of the drum session they were invited to share their innermost feelings and emotions they experienced before, during and after the drum session. They were quite moved. This for me was so moving too as I realised how he touched these students without even imposing too much of his own ideas and experiences to co-erce them into sharing. For some of these students who come from backgrounds of such diversity, it was a something they themselves were amazed at allowing themselves enjoy. I was so proud of them simply living in the moment and being open to the experience. When we shared a moment reflecting thereafter, some of them wanted to know when he was returning almost validating the positive experience they had. I will have Adam back in a flash and would high recommend him should he want to run a session with a group of students. He has the natural ability to connect with young people on their level.